What is a stay-at-home parent worth? Are you a stay-at-home parent? According to this study, your work is worth a six-figure salary in the paid job market. Salary.com has released it’s Mom Salary Survey, an annual survey of 6,000 American stay-at-home mothers. The report uses industry salary data and the time that mums spend doing different tasks to calculate an annual salary including overtime. On average, stay-at-home mums work 94 hours a week and perform duties that would earn US$113,568 (AUD$122,964) in the paid employment sector. What about working mums? The report found that the average full-time working mum spends an additional 58 hours a week on household and childcare duties. 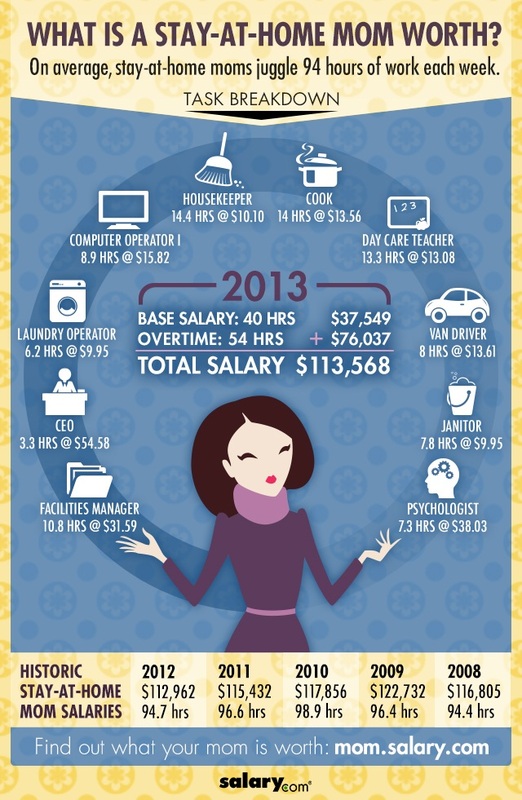 According to Salary.com, these after-hours home duties are valued at USD$67,436 (AUD$73,012). We should not forget stay-at-home dads, too. While the number of stay-at-home dads is low compared with mums, the number has doubled in Australia over the last few decades as more women are becoming primary breadwinners.